Normal finger position and movement occur from the balanced actions of many important structures. Ligaments support the finger joints. Muscles hold and move the fingers. Tendons help control the fine motion of each finger joint. Disease or injury can disturb the balance in these structures, altering normal finger alignment and function. The result may be a crooked finger, such as a swan neck deformity of the finger. What parts of the finger are involved? The fingers are actually made up of three bones, called phalanges. The three phalanges in each finger are separated by two joints, called interphalangeal joints (IP joints). The joint near the end of the finger is called the distal IP joint (DIP joint). (Distal means further away.) 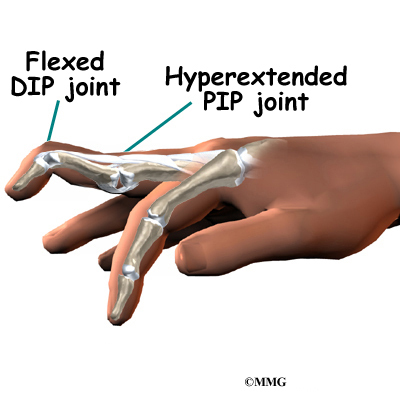 The proximal IP joint (PIP joint) is the middle joint between the main knuckle and the DIP joint. (Proximal means closer in.) The IP joints of the fingers work like hinge joints when you bend and straighten your hand. The tendons that allow each finger joint to straighten are called the extensor tendons. The extensor tendons of the fingers begin as muscles that arise from the backside of the forearm bones. These muscles travel toward the hand, where they eventually connect to the extensor tendons before crossing over the back of the wrist joint. As they travel into the fingers, the extensor tendons become the extensor hood. The extensor hood flattens out to cover the top of the finger and sends out branches on each side that connect to the bones in the middle and end of the finger. When the extensor muscles contract, they tug on the extensor tendon and straighten the finger. Ligaments are tough bands of tissue that connect bones together. Several small ligaments connect the extensor hood with other tendons that travel into the finger to bend the finger. These connections help balance the motion of the finger so that all the joints of the finger work together, giving a smooth bending and straightening action. 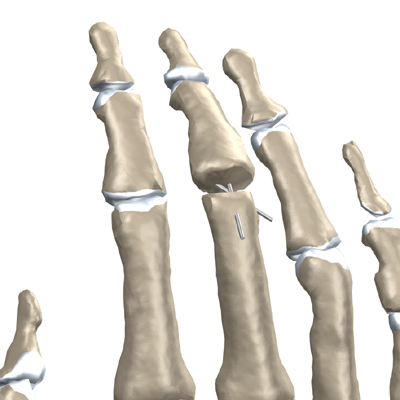 In the PIP joint (the middle joint between the main knuckle and the DIP joint), the strongest ligament is the volar plate. This ligament connects the proximal phalanx to the middle phalanx on the palm side of the joint. The ligament tightens as the joint is straightened and keeps the PIP joint from bending back too far (hyperextending). Swan neck deformity can occur when the volar plate loosens from disease or injury. How does this condition occur? A swan neck deformity describes a finger with a hyperextended PIP joint and a flexed DIP joint. Conditions that loosen the PIP joint and allow it to hyperextend can produce a swan neck deformity of the finger. Rheumatoid arthritis (RA) is the most common disease affecting the PIP joint. Chronic inflammation of the PIP joint puts a stretch on the volar plate. (As mentioned earlier, the volar plate is a supportive ligament in front of the PIP joint that normally keeps the PIP joint from hyperextending.) As the volar plate becomes weakened and stretched, the PIP joint becomes loose and begins to easily bend back into hyperextension. The extensor tendon gets out of balance, which allows the DIP joint to get pulled downward into flexion. 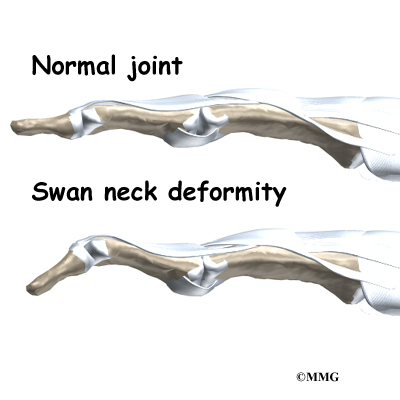 As the DIP joint flexes and the PIP joint hyperextends, the swan neck deformity occurs. Other conditions that weaken the volar plate can produce a swan neck deformity. The small (intrinsic) muscles of the hand and fingers can tighten up from hand trauma, RA, and various nerve disorders, such as cerebral palsy, Parkinson's disease, or stroke. The muscle imbalance tends to weaken the volar plate and pull the PIP joint into extension. Weakness in the volar plate can also occur from a finger injury that forces the PIP joint into hyperextension, stretching or rupturing the volar plate. As mentioned, looseness (laxity) in the volar plate can lead to a swan neck deformity. Clearly, PIP joint problems can produce a swan neck deformity. But so can problems that start in the DIP joint at the end of the finger. Injury or disease that disrupts the end of the extensor tendon can cause the DIP joint to droop (flex). An example from sports is a jammed finger that tears or ruptures the extensor tendon at the end of the finger (distal phalanx). Without treatment, the DIP joint droops and won't straighten out. This condition is called a mallet finger. The extensor tendon may become imbalanced and begin to pull the PIP joint into hyperextension, forming a swan neck deformity. Chronic inflammation from RA can also disrupt the very end of the extensor tendon. Inflammation and swelling in the DIP joint stretches and weakens the extensor tendon where it passes over the top of the DIP joint. A mallet deformity occurs in the DIP, followed by hyperextension of the PIP joint. Again, the result is a swan neck deformity. 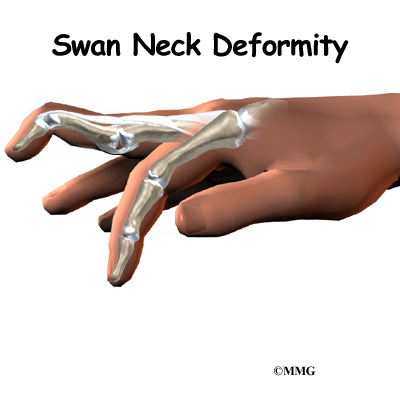 What do swan neck deformities look and feel like? Inflammation from injury or disease (such as RA) may cause pain and swelling of the PIP joint. The PIP joint eventually is free to bend back too far into hyperextension. The DIP joint is bent downward into flexion. Eventually, the imbalance leads to the typical shape of the finger with a swan neck deformity. Usually the diagnosis is evident just from the physical examination. An X-ray may be ordered so the doctor can check the condition of the joint surfaces, examine joint alignment, and see if a fracture is present (as in a traumatic finger injury). No other tests are required normally. What can be done for a swan neck deformity of the finger? Treatment for swan neck deformity can be nonsurgical or surgical. The approach your doctor uses depends on whether the PIP joint is flexible or stiff. Successful nonsurgical treatment is based on restoring balance in the structures of the hand and fingers. The PIP joint must be supple (not stiff). Aligning the PIP joint and preventing hyperextension should help restore DIP extension. If it doesn't, surgery may be needed. You may require professional rehabilitation. A physical or occupational therapist addresses the imbalances that have formed the swan neck deformity. Stretching, massage, and joint mobilization are used to try and restore finger alignment and function. A special splint may be used to keep the PIP joint lined up, protect the joint from hyperextending, and still allow the PIP joint to bend. Newer styles are shaped like jewelry rings and are available in stainless steel, sterling silver, or gold. This approach works best for mild cases of swan neck deformity in which the PIP joint is supple. Splinting and a rigorous therapy program are usually not successful in altering the imbalance responsible for the deformity. However, many hand surgeons will try six weeks with the splint and exercise to improve PIP joint mobility before performing surgery. In cases where the balance cannot be restored to a tolerable limit with splinting, surgery may be required to reconstruct and rebalance the structures around the PIP joint. The surgeon releases, aligns, and balances the soft tissues around the PIP joint. The surgery may involve the skin (dermadesis), the tendons (tenodesis), or the ligaments (mobilization or reconstruction). Surgery to repair the soft tissues that are contributing to a swan neck deformity carries a relatively high risk of failure to achieve completely normal functioning of the finger. All of the repair and reconstruction procedures are dependant on a well designed and rigorous exercise program following the surgery. A physical or occupational therapist will work closely with you during your recovery. Swan neck deformity with a stiff PIP joint sometimes requires replacement of the PIP joint, called arthroplasty. The surgeon works from the back surface (dorsum) of the finger joint. Both surfaces of the PIP joint are removed to make room for the new implant. With the new joint in place, the surgeon balances the soft tissues around the joint to ensure that the new joint can easily bend and straighten. When RA produces a mallet deformity of the DIP joint and the PIP joint is supple, surgeons may consider fusing the DIP joint. Joint fusion is a procedure that binds the two joint surfaces of the finger together, keeping them from moving. Fusing the two joint surfaces together eases pain, makes the joint stable, and helps prevent additional joint deformity. If past treatments, including surgery, do not stop inflammation or deformity in the PIP joint, fusion of the PIP joint may be recommended. The PIP joint is usually fused in a bent position, between 25 and 45 degrees. The goal of nonsurgical treatment is to get the finger joints, tendons, and muscles in balance. If nonsurgical treatment is successful, you may see improvement in eight to 12 weeks. Your doctor may have you work with a physical or occupational therapist during this time. Your therapist will work with you to obtain and use your finger splint. Special forms of stretching may help reduce tightness in the intrinsic muscles of the hand and fingers. Strengthening exercises can help with alignment and function of the hand and fingers. You'll wear a splint or brace after surgery. A protective finger splint holds and protects the joint and is used for at least three weeks after surgery. Physical or occupational therapy treatments usually start three to six weeks after surgery. You will likely need to attend therapy sessions for three to four months, and you should expect full recovery to take up to six months. The first few therapy treatments will focus on controlling the pain and swelling from surgery. Then you'll begin gentle range-of-motion exercise. Strengthening exercises are started eight to 10 weeks after surgery. You'll learn ways to grip and support items in order to do your tasks safely and with the least amount of stress on your finger joint. As with any surgery, you need to avoid doing too much, too quickly. Eventually, you'll begin doing exercises designed to get your hand and fingers working in ways that are similar to your work tasks and daily activities. Your therapist will help you find ways to do your tasks that don't put too much stress on your finger joint. Before your therapy sessions end, your therapist will teach you a number of ways to avoid future problems. Your therapist's goal is to help you keep your pain under control, improve your strength and range of motion, and regain fine motor abilities with your hand and finger. When you are well under way, regular visits to your therapist's office will end. Your therapist will continue to be a resource, but you will be in charge of doing your exercises as part of an ongoing home program. Since 1981, the physicians at the Midwest Bone & Joint Institute have been caring for patients in the Chicago area. We have earned the distinguished reputation as some of the most experienced, respected and well-trained orthopedic surgeons in the country. Each of our physicians has specialized training in orthopedic surgery as well as fellowship training in their subspecialty. We strive to provide outstanding care to all of our patients while facilitating a rapid return to an active, pain-free lifestyle. We invite you to explore our web site and discover why patients have entrusted us with their orthopedic care for over three decades. Serving the communities of: Algonquin, Lake in the Hills, Huntley, Crystal Lake, Carpentersville, Dundee Township, Barrington, Lake Zurich, Cary, Wauconda, Palatine, South Elgin, Elgin Royal, Elgin, Geneva, St Charles, Elburn, and the Chicago region.